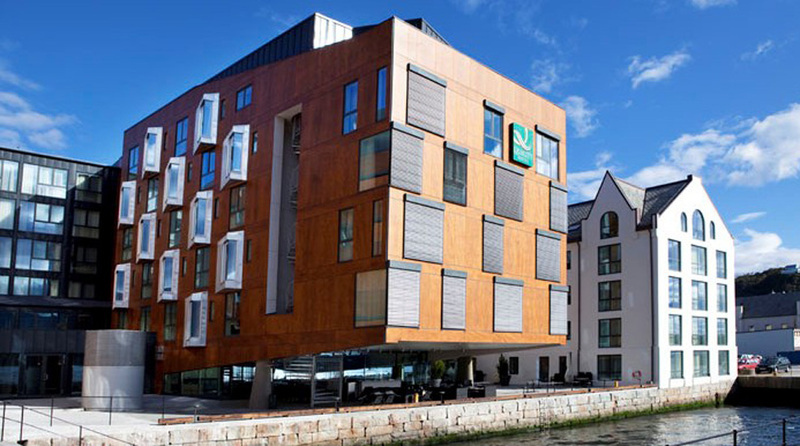 See you soon at Quality Hotel Waterfront – a conference hotel with charm in the heart of Ålesund. Enjoy modern design and fantastic views of mountains and the fjord. The hotel is just 200 metres from Brosundet in Ålesund, and close to Ålesund's shopping, restaurants and sights. We offer modern rooms, a delicious breakfast buffet, gym and conference rooms for both small meetings and large conferences. Treat yourself to a visit to theAqua Restaurant and Bar. The views come free. Quality Hotel Waterfront opened its doors in the summer of 2011. We have a unique location right by the water in the centre of Ålesund. The hotel is split between three different buildings; Pakkhuset, Jugendhuset and the newly built Signaturhuset. Both Pakkhuset and Jugendhuset are historical buildings in Art Nouveau style, each carefully renovated to make up part of our new, modern conference hotel. Together with our art deco Signaturhuset we can offer a truly exceptional hotel and atmosphere. Experience modern architecture, design furniture and local unique art and graffiti. Aqua Restaurant and Bar can accommodate up to 150 guests, who can enjoy the striking view of Aspevågen harbour with their dinner. The bar adjoins the restaurant, and during the summer months food and beverages can be enjoyed outdoors on the quayside. The view of the Borgundfjorden and Sunnmørsalpenemountains is stunningly beautiful, and the boating on Aspevågen is both fascinating and lively all year round. We are a course and conference hotel, with a conference area of 1000 m2, divided into nine meeting rooms of various sizes. All our meeting facilities are equipped with modern AV technology. Our plenary hall, Akvariet, has capacity for 280 people in theatre seating and is an excellent choice for banquets, receptions and parties as well as for conferences. More information about our conference facilities here . It's also possible to book an airport shuttle service from our reception. Apotekertorget: 3 min walk from the hotel.